Jennie M's Stampin Spot: On the Double-Duty Card Train! I'm staying on the double-duty train and this thank you is for two challenges. 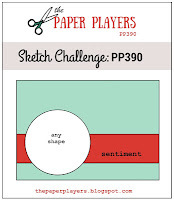 First, the sketch is for The Paper Players#390 here. 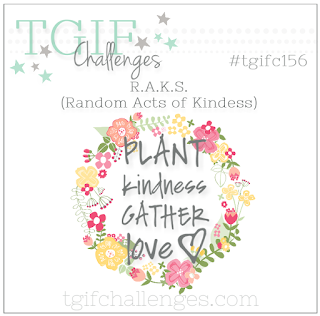 And then this also qualifies for TGIF Challenge#156-Random Acts of Kindness, here. 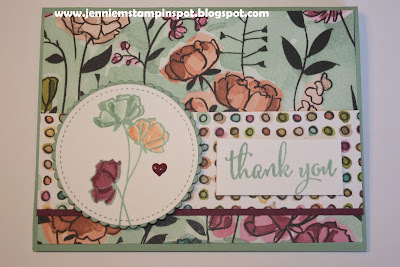 Love What You Do is the stamp set with some of the gorgeous Share What You Love Specialty DSP. And I used some Mint Macaron since it's going to be a core color with the Color Revamp in the new catalog. Such pretty paper! Isn't it good to see Mint Macaron back?! Thanks for joining us at The Paper Players. The colors in this card are gorgeous, Jennie! I love that background paper and your trio of stems. Thanks for playing along with us this week at The Paper Players!